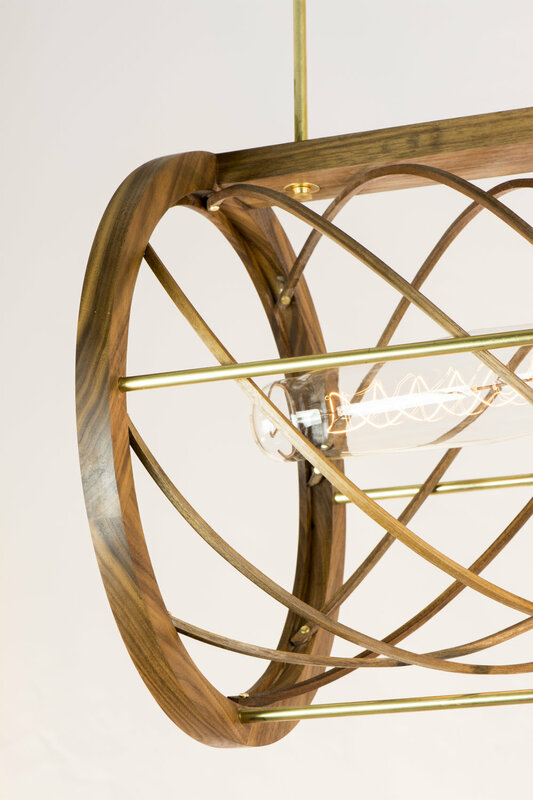 36 x 16 x 36 inches (L x W x H.) Black walnut - brass hardware - fully dimmable bronze fixture - tungsten bulbs. This ceiling mounted fixture is made from steam bent strips of walnut, stretched and fastened between the ends of the frame to produce an organic helical coil form. The light provides the perfect amount of brightness and warmth to a dinner table or common space. Like all of our products at Sam Keene Studio, COIL is made to order and can be built to custom sizes, with additional bulbs and lighting arrangements for larger spaces.